If you ever see a bear in the wild, chances are, it’s a black bear. These small, timid bears live in forests and woodland areas in many parts of the United States. Male black bears weigh between 150 and 250 pounds. Females are smaller. Black bears are omnivores. They eat mostly plants, roots, small mammals, insects and lizards. They can smell food from far away and will get into trash cans or camp sites. Black bears are usually afraid of people. If they lose their fear of people, they sometimes attack. That’s why you should never, ever feed a bear. Black bears sleep in caves during the winter. Mamas have babies in the caves. They wake up to care for their babies. Black bears are good moms. They feed, dry and protect their babies. If a predator comes, mama black bears scoot their babies up a tree. 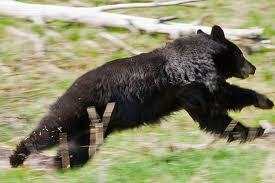 Black bears can run up to 30 miles per hour. Black bears like to swim. Black bears aren’t always black. They can be brown, red, or even white. A Red (Black) Bear . Black bears aren’t always black. Pretty sure you weren’t expecting that all about black bears. Black bears usually eat plants and berries. A video documentary of a mother black bear teaching her cub some life lessons. Question: Are black bears safe to pet? 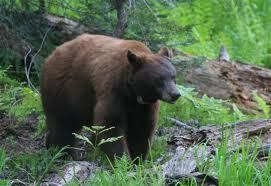 Answer: Black bears aren’t as aggressive as brown bears, but they are wild animals. Leave them alone and never feed them. If one approaches you, stand tall, wave your arms and make noise. Back slowly away. Question: How long do cubs stay with their mom? 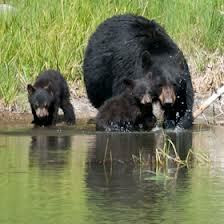 Answer: Baby black bears stay with their mothers for 2 to 3 years. Question: Do black bear eat large mammals? 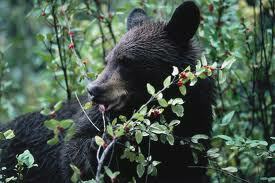 Answer: Black bears usually eat plants and berries. They love ants, grubs and worms. Enjoyed the Easy Science for Kids Website all about Black Bears info? Take the FREE & fun Black Bears quiz and download FREE Black Bears worksheet for kids. For lengthy info click here. Declan, Tobin. " Black Bear Facts for Kids ." Easy Science for Kids, Apr 2019. Web. 23 Apr 2019. < https://easyscienceforkids.com/all-about-black-bears/ >.